The first time I tried this pork chop and vegetable rice was in a Shaighai restaurant in Hong Kong, I was immediately hooked up and especially fond of the vegetable rice. This dish is very balanced and wonderfully tasty. I was bumped into some foreigners in Asian stores and asked about how to cook baby bok choy for a several times. It seems that western people are getting to know and like this kind of Chinese vegetable. In Hong Kong, there’s a trend of cooking baby bok choy with rice, that was originated from Shaighai cooking. 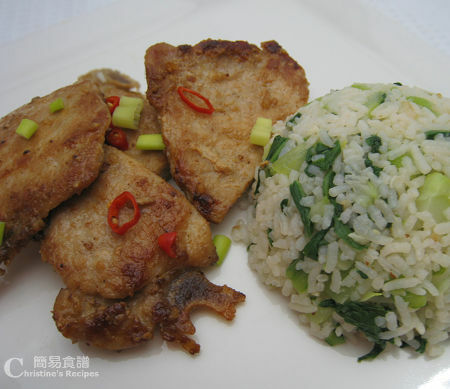 And this Pork Chops with Vegetable Rice (排骨菜飯) is a famous Shaighai cuisine, suitable for home cooking as well. So I just pan-fried the pork chops and add some fish sauce. Yes, I know….. I know that fish sauce is Thai sauce. Oh, that’s my kind of cooking, adding bits of yummy sauce from the fridge to my liking. I found these pork chops tasted heavenly after mixing with the fish sauce. If you want to maintain the authentic Shaighai taste of this dish, then not to add any fish sauce. That’s it. Rinse pork chops and wipe dry with kitchen papers. Trim excess fat and mix with marinade for 20 minutes. Rinse rice and cook in a rice cooker, just like the way you used to cook rice, by adding chicken stock instead of water this time. Add 2 cups of chicken stock into rinsed, drained rice, then cook until done. Rinse baby bok choy and drain well. Roughly chop into pieces. Separate leaves and white stems apart. Heat oil in a wok or pan, sauté ginger slices over medium-high heat. 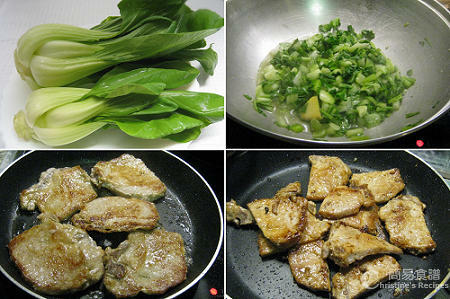 Add white stems of bok choy first in wok as they need more time to be softened. Stir fry stems for a while until soften a bit, then followed by leaves. Sprinkle salt to taste and combine well. Pour 2 tablespoons of chicken stock and cook bok choy until 70% done. Add sesame oil and discard ginger. Drain well. Or else your rice would be too soggy. Toss bok choy and stir with the cooked rice. Sprinkle salt to your taste. Remember to taste it by yourself until you’re satisfied. Cover and set aside. Heat 2 tablespoons of oil in a frypan. Cook pork chops until both sides are lightly brown and cooked through. Remove and place on a platter. Cut pork chops into small portions if desired. Saute garlic and shallot in the same frypan. Toss back pork chops. Sprinkle fish sauce and quickly combine well. Dish up. Garnish with red chilies, served with hot vegetable rice. Enjoy! Look at that dish. Same here, I don't like deep-frying for the same reason. :)But that is so true but we could get the same result but using less oil, right? What a beautiful and simple dish. Oh my, you are truely tempting me - next time we do pork chops, this goes to top of the list! This looks very very tasty! I'm hungry now! My favourite at Pancake house in Melbourne! I love this dish so much. And now I know that it is deep fried. Shall make it at home next time. Look at that fabulous looking dish!! I so love your flavours & colours!! What a delicious preparation for pork chops, I love this authentic recipe, can't wait to try it! I would be so happy if someone put this meal down in front of me. What a great way to prepare pork chops! So nice to have delicious one dish meal at home. I like fish sauce too...so delicious! I like pork chop a lot but not cooking it anymore! My hubby and the children don't like pork at all. So, we only have chicken, seafood or duck. Btw, yours look so flavourful and inviting! Have a great weekend & Cheers. Hi there! I've just given you an award - please stop by my blog to pick it up! I gave it to you because I love how to promote Chinese/Asian cuisine - you make your recipes really accessible! Great Job! Why bother to spend loads of time and effort trying to learn new dishes when you could take advantage of this detailed, illustration rich and simple cookbook to create meals that will wow your friends and family over?